Never throw away meat bones – a nutritious stock is only a few steps away! Meat stocks contain minerals from the bones, marrow, and cartilage. In stock they are available in easy to use form. The addition of vinegar during the preparation of stock increases the mineral content by helping to draw them out. Hydrophilic colloids (gelatin) are also present in homemade stock and are extremely beneficial! Gelatin (made up of the amino acids arginine and glycine) aids digestion and encourages the body to utilize complete proteins more efficiently. You can tell the stock has a decent amount of gelatin in it if it thickens or even jells when cooled. This is a very good thing! Homemade stocks also contain components of collagen and cartilage (glucosamine and chondroitin), which have been shown to be beneficial in the treatment of osteoarthritis and rheumatoid arthritis. For more detailed information on the benefits of stock, please see Weston A. Price Foundation or Nourishing Broth. Homemade stock is SO EASY, there is no reason to not include in in your repertoire! There are so many uses for stock beyond soups and stews. Sauces and gravies, poaching and braising, vegetable side dishes, and so much more. The great thing about stock is that you can make a lot and storing it is easy. Pour the desired amount into labeled plastic baggies and freeze. Then it’s ready when you need it. We NEVER throw away bones in our house – there’s way to much value in them! See below for beef, lamb, pork, and turkey variations. Feel free to add any other vegetable scraps you may have. I have added fennel fronds and leeks with good success! Place all of the ingredients in a large stock pot or a slow cooker. Allow it to sit for 30 minutes to one hour. Then cover and simmer over low heat for about 12 hours. In the past I would simmer my stock for up to 24 hours, but found that is wasn’t consistently gelling. After reading Sally Fallon’s newest book, Nourishing Broth, I’ve decreased my cooking time by half and am getting to best gel! 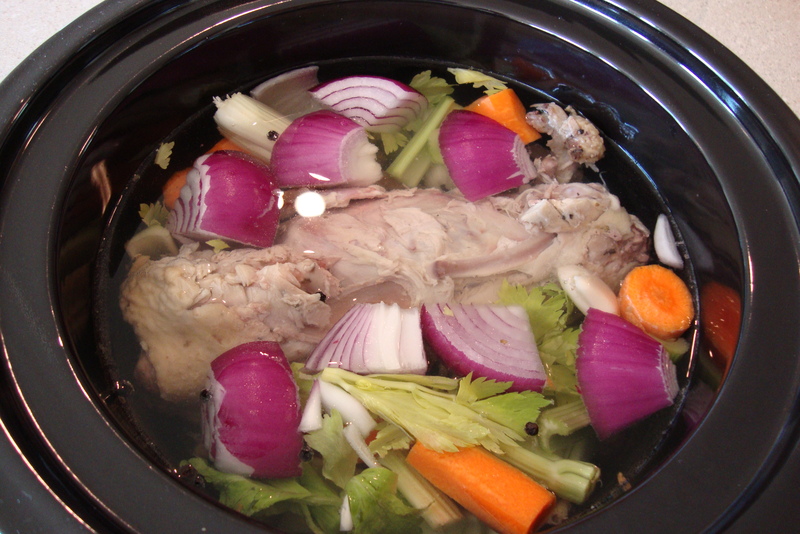 If you are using a slow cooker, turn it on low before bed and you will have delicious stock in the morning. I prefer the slow cooker method if my ingredients fit because I don’t have to fuss with adjusting the heat on the stove. I recommend checking on the stock periodically and adding a cup or 2 of water if the liquid level is dropping. When you are ready (hopefully you have given it 12 hours), strain the stock through a fine mesh sieve. Place the stock in the refrigerator for a few hours. Skim any fat that rises to the surface. At this point, you can keep the stock in the refrigerator for 4-5 days or freeze for a later date. Beef Stock: Roast 5 pounds of meaty stock bones from grass-fed, organic beef in a 350 degree oven until browned. Place bones and all of the above ingredients in a large stock pot. Increase the vinegar to 1/2 cup. Proceed as for chicken stock, but simmer for up to 24 hours. Lamb Stock: Use 5 pounds of lamb bones and 1/2 cup vinegar, as well as the above listed ingredients. Proceed as for chicken stock, but simmer for up to 24 hours. Pork Stock: Use bones from a large pork roast and 1/2 cup vinegar, as well as the above listed ingredients. Proceed as for chicken stock, but simmer for up to 24 hours. Turkey Stock: Use the bones from a roasted turkey and 1/4 cup vinegar, as well as the above listed ingredients. You may need to increase the amount of water to cover the ingredients. Proceed as for chicken stock. Beef, Chicken, Lamb, Pork, Slow cooker, Stock, Weston A. Price Foundation. Bookmark. If the bones aren’t covered in a sauce, I generally save them for stock. I would keep those venison steak bones for sure!! Just know that with small bones like ribs and steak bones, you will need a lot more of them to make a pot of stock. Also, venison, pork, and beef stock will be a little grayer in color, but will still taste great! i am curious about the reason for using vinegar in the stock? Thanks for the question. The addition of a acid like vinegar or lemon juice helps to draw minerals from the bones. Not a necessary step, but makes for a more nutritious stock! Can I put a load of veg in with this stock, and then cook veg in it… then liquidize, to make a big pot of soup, to freeze individual portions ? It’s really great to save the bones of pork or chicken bones. Through bones you can make a good and great tasty soup.